As a new bride living in Wichita Falls, Texas, 50 years ago, Betty Prentice hadn't even heard of the Wesleyan Service Guild. But she went to a circle meeting anyway, at the invitation of a friend  and that transformed her life. Betty grins when she describes her initial motivation for attending then-Women's Society of Christian Service meetings: "Some of the women asked 'what goes on with our money? Is it getting through?' They couldn't go to daytime events so I volunteered to go and scope out 'the enemy' to find out what they were doing with our money." Evidently Betty's questions were answered. And after those first few meetings, she was hooked. She says, "every time there was a training event, I went. I was taught life skills all the way through" as she continued her involvement in WSCS, the Wesleyan Service Guild, and finally United Methodist Women. "I kind of think I was just drawn" to the organization, Betty says. "I don't know if it was one person or all the ladies in my unit or the God-sized hole that I kept trying to fill, but I just always had the feeling that this is where I was supposed to be and this is what I was supposed to do." Betty raised a family and taught school for 20 years and still managed to hold offices for decades in United Methodist Women and the predecessor organizations. 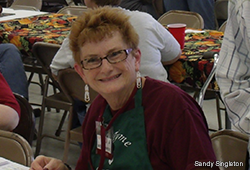 Last fall she finished a term as Oklahoma Conference Treasurer, and before that she'd served in several district offices  secretary, communications, vice president, treasurer, president  and as conference Secretary of Program Resources. She's a firm believer in the value of Schools of Christian Mission, too, (now named Mission u) and has only missed attending two or three times over the years. She says that "if you want music, you go to the School of Christian Mission. You learn the mission songs; these are the ones that put feet to our belief, get you up out of your seat, make you ask 'where does God want me to be?'" Asking "where does God want me to be?" took Betty in an unexpected direction a few years ago. Betty paid her own way on a Rotary-sponsored trip to India for a National Immunization Day to combat polio. (Polio eradication is a major emphasis of Rotary.) That year one of the United Methodist Women mission studies focused on India and Pakistan. So on an afternoon free from immunization duties, Betty looked up the address of Isabella Thoburn College in the phone book, found a driver to take her there, approached the front gate, and asked for a tour. "I'm a Methodist and I'm from the United States." When she produced a business card with the United Methodist Women logo, the gate swung open, the staff welcomed her in, and the head of the College herself, Dr. E.S. Charles, gave Betty a tour of the buildings and grounds. Attending her first Assembly also opened her eyes to the worldwide scope of United Methodist Women's work. Betty says, "Seeing women from all over the United States as well as the world, and getting to see and hear first-hand where your money goes...well, sometimes it is surprising that Assembly doesn't 'look like' your unit. They also sound different. It's a time to just 'take the blinders off' and see more of the world. There's more to UMW than just us." Betty is now an unabashed, enthusiastic supporter of United Methodist Women's worldwide mission work. "I've seen the beginning [Isabella Thoburn College], I've been to a lot of our mission sites. I know what goes on. I've been there, I've seen it." And so she's planning on leaving a significant gift from her estate to the national organization to support mission work for decades to come. "Leave it to the national organization rather than to the local unit," she encourages, "because the local may not have the vision" for mission that the national organization has. "The work we do is special," Betty declares. She knows that no organization other than United Methodist Women could have taught her so much and or filled her life so completely  or made such a difference for over a century in the lives of countless women, children, and youth around the world. Just as Betty is faith, hope, and love in action during her lifetime, her legacy gift to United Methodist Women after her death will continue her faith, hope, and love far into the future.